Client review has always been a disjointed and at times cumbersome process for editors struggling to match client comments and annotations with the correct frames — made even more so when switching between email threads, different browsers and annoying paper trails. 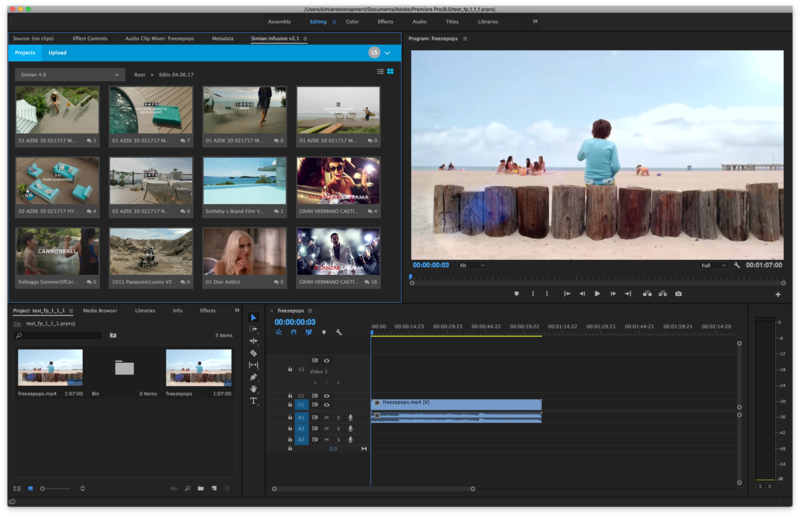 That’s why we launched the editor’s new best friend, Infusion, our plugin for Adobe Premiere Pro. Infusion provides editors (along with their assistants) and their clients with faster, more accurate reviews, notes and changes. Reviewer comments and annotations are imported directly from your Simian project right into Premiere with no jumping back and forth between various communications media and Adobe. Everything’s right in your editing environment! Editors can reply to comments from within the plugin and share with everyone on the team further eliminating email trails while storing all feedback in one digital hub. Annotations can also appear directly within edit markers in Premiere, giving editors more precise feedback during the editorial process. Infusion allows revised or changed video to be exported directly back to Simian for another round of review, while automatically encoding the video, saving editors an extra step during the review process. New to Simian? See why ad agencies, production companies and post studios choose Simian to share and collaborate on video. If you're already using Simian, just download Infusion for Adobe Premiere Pro to get started!